Growing up along Colorado’s Front Range, as a young lepidopterist, the last warm days of the season were always special opportunities, to see how late the toughest butterflies could persist into the shortening and progressively colder days of November. On a typical year, up to a dozen butterfly species can usually still be found here on warm days in early November, with that number dwindling to nearly or exactly zero by the end of the month. Adults of only five butterfly species have ever been found in nature in December in Colorado, including the Orange Sulphur Colias eurytheme (late date of 4 December), Clouded Sulphur Colias philodice eriphyle (15 December), Dainty Sulphur Nathalis iole iole (5 December), Painted Lady Vanessa cardui (4 December) and the Mourning Cloak Nymphalis antiopa (31 December). Of these, only the Mourning Cloak passes the winter here as an adult, though along with other nymphalid butterflies that overwinter as adults, it usually resists the temptation to fly around on warm winter days until late February or early March. Remaining adults of the other four species will inevitably perish with the onset of winter, but they hang on for as long as they can! 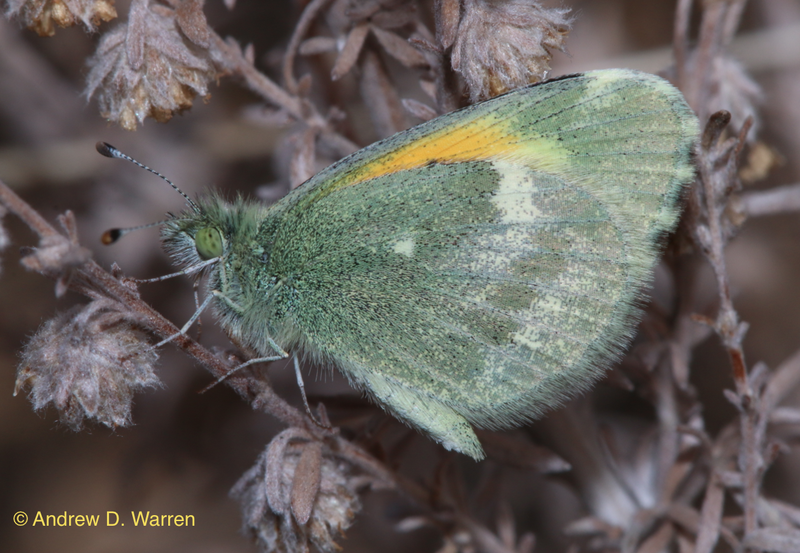 Of all the adult butterflies that have persisted into December in Colorado, all are year-round residents here, except for the Dainty Sulphur. 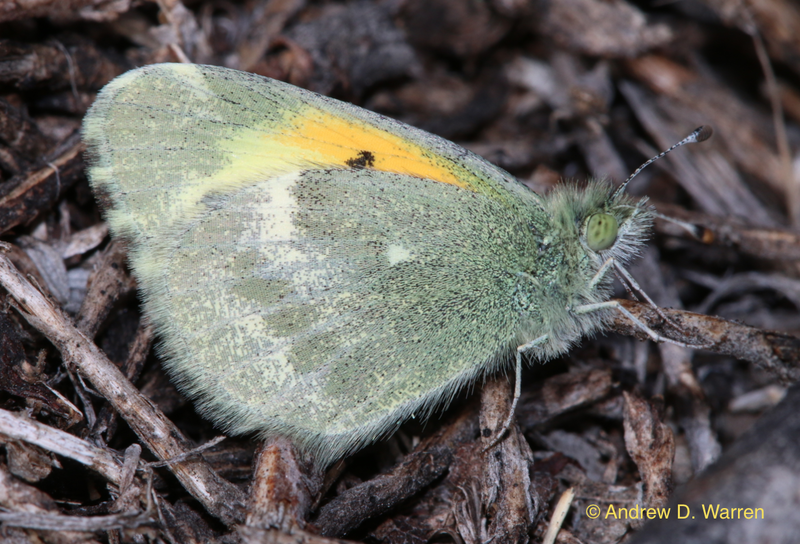 The tiny Dainty Sulphur cannot survive the long winters in Colorado, and freezes out of the state on an annual basis. But starting in April each year, these diminutive butterflies begin to arrive, from Texas and the desert southwest, probably due to winds more than their own dispersal abilities, and by the end of the season, they can literally be found everywhere in the state, even on alpine tundra above 13,000′ elevation! There are several larval foodplants for them here in warm months, and the Dainty Sulphur can produce two or three generations in Colorado before it is finally frozen out at the end of the season. But the late-season adults come equipped with an unusually dark, greenish ventral coloration, for taking in the early winter rays, and prolonging late-season life. I arrived back in Colorado for the holidays two days ago, and did not expect the unseasonably warm conditions awaiting me! It was 62 degrees F yesterday, and it reached 64 today! Of course, such conditions mandate field work (and postponement of holiday shopping), to see what is still out! After the recent frigid low of -14 degrees F a couple weeks ago, I did not expect to find many insects, but have been pleasantly surprised! I spent the next several minutes getting photos. In the persistent breeze and warm morning sun, he did not sit still in any one place for long, and most of the time, after taking flight, he would land in places that were not conducive for photography. But, finally, he landed in a clearing where I could get several crisp photos. As you can see below, he was in excellent condition, not missing a scale! This is the latest a non-overwintering adult butterfly has ever been found in Colorado! Judging from his immaculate condition, he most likely survived the recent frigid weather as a pupa, and probably eclosed in yesterday’s unseasonable afternoon warmth. While there is little or no chance of this guy finding a mate or surviving even a week (cold weather predicted to return soon), his appearance today is testament to the toughness of this tiny butterfly! This entry was posted in Uncategorized on December 19, 2013 by LepScience. A favorite flower in my garden, white alyssum, is shared by the dainty sulfur in the San Antonio area throughout our winters. That really is a late record. You could probably find something like that in Gainesville. I’ve seen Eurema in Texas into December, but I would never have expected this in Colorado! The photo is impressive, too. Thanks for posting this.